3… 2… 1… Blast off! Let’s explore space. Build a rocket to carry the payload that’s just right to complete your mission. Xtronaut was designed by Dante Lauretta, a real NASA scientist, to introduce kids to how rockets work. 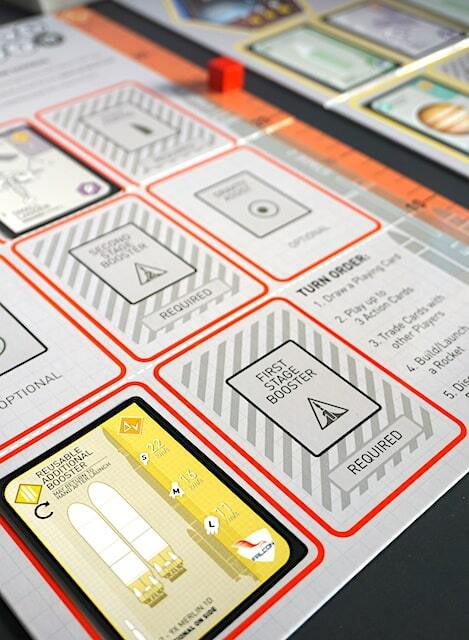 Each player gets a gameboard, with space for several different kinds of rocket parts. 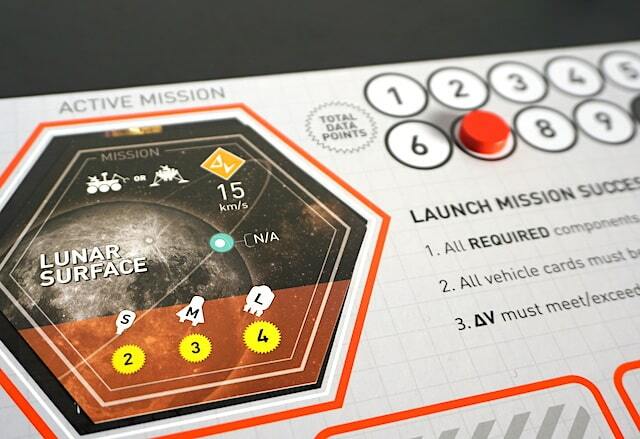 Their gameboard also contains a score tracker (“Total Data Points”) and a ΔV (change in velocity) track. Give each player a mission card and a hand of five playing cards. Set the rest of the mission cards and the playing card deck face-down near the center of the table. On my turn, I draw a single card from the playing card deck. Then I may play up to three “action” cards. Action cards allow me to do things like draw additional cards, steal cards from other players, or take rocket cards from the discard pile. After playing actions, I may choose to trade cards with other players. This is an important way to get the parts my rocket needs to be able to launch. After any trading, I can place cards onto my board. Options include vehicles (payloads), spacecraft parts, and gravity assists. If my rocket has all the pieces it needs, I might be able to launch it! Lastly, I can discard as many cards as I want and then draw up to a hand size of five cards again. A key component of Xtronaut is building a complete rocket that meets mission specifications. Every rocket must have left & right fairings, a vehicle/payload, a first stage booster, and a second stage booster. 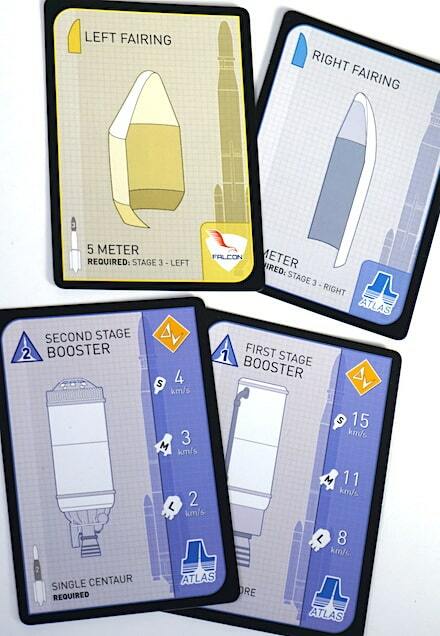 Additionally, the boosters and fairings must all be from the same product line. Different manufacturers don’t play nicely together! Don’t forget the vehicle! Each mission only accepts certain vehicle types (clearly labeled). If your mission is to visit the surface of a planet, an orbiter won’t work. But if the mission is to orbit a moon and return, you probably don’t want a rover or a lander. Lastly, the combined ΔV must add up to at least the required number for the mission. Too small, and you won’t make it to your destination. Missions close to earth require a smaller ΔV. A new mission, should you choose to accept it. If all the requirements are met, your rocket can be launched and your mission is a success! Give yourself “data points” according to your vehicle size (larger vehicles score more points). Then discard all the cards on your player board. Draw three new mission cards, face down. Use the mission briefs on the backside of the cards as clues to help you decide which one will become your new active mission. Then return the others to the bottom of the mission deck. Players take turns until someone achieves at least 10 “data points” from completing missions. That player wins! Not quite ready to blast off. Xtronaut introduces a level of realism we don’t see in other space-themed games. It’s truly educational and provides lots of opportunities for discussion. In fact, the rule book contains a science workbook filled with facts about space and the Osiris-REx mission for which game creator Dante Lauretta is the mission leader. Unfortunately, it was not a hit with our family. We tend to play pretty competitively, so we didn’t do a lot of trading and did play many action cards to sabotage each other’s rockets. This made our games of Xtronaut last a lot longer than the stated 30 minute playing time. 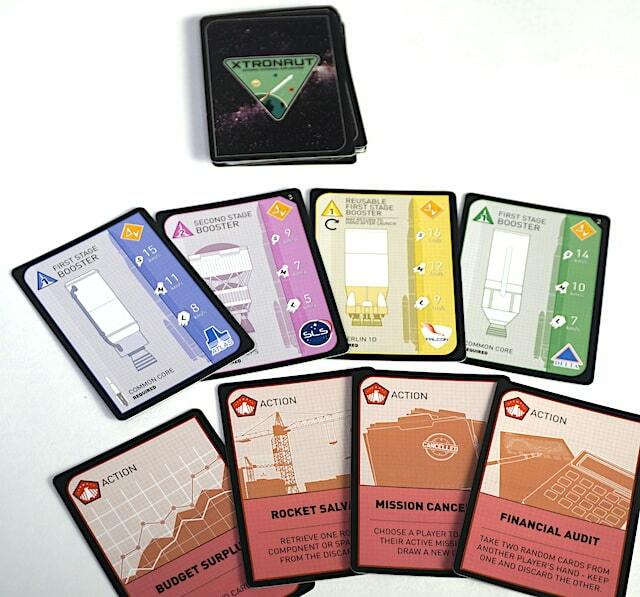 In our interview with Professor Lauretta, he told us that Xtronaut started as flashcards for kids, and quickly became a trading-card activity as each kid would help the others get the right parts for their rocket. Even then, Xtronaut quickly becomes a race to finish your second mission. Since most missions award a range of points, two complete missions is all you’ll usually need to end the game. A player trying for several low-scoring missions will be at a disadvantage, because they’ll need to gather rocket parts more times. Even though we didn’t love Xtronaut, it succeeds at its mission, to introduce kids ages 7+ to the wonders of space flight. It would be a great game for kids in an after-school group or a homeschool co-op to play together. Buy it on Amazon or ask for it at your friendly local game store. 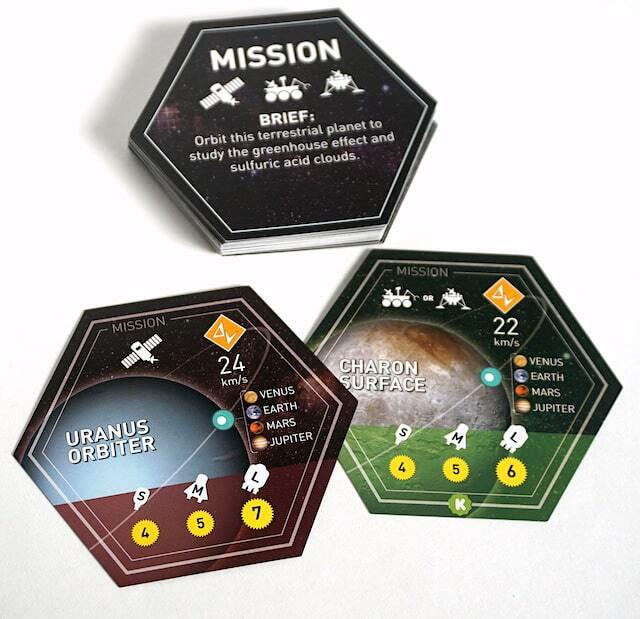 The Family Gamers received a copy of Xtronaut: The Game of Solar System Exploration from Dante Lauretta for this review.